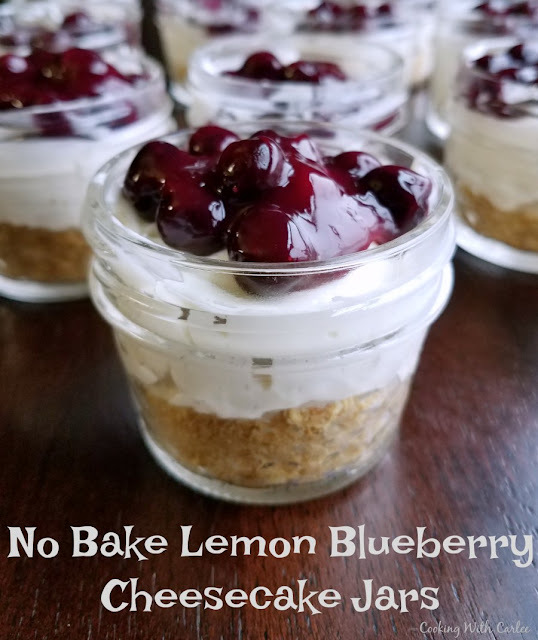 Fluffy and luscious, these no bake lemon blueberry cheesecakes are like taking a bite of spring if spring was a lemon cheesecake cloud! Really though, they are so good! 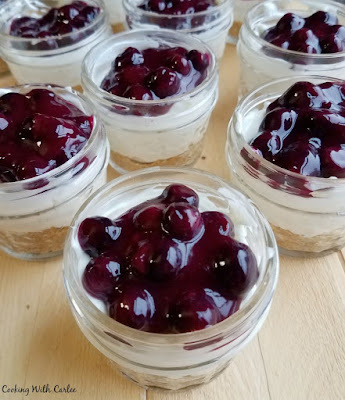 These creamy and fresh no bake lemon cheesecakes are topped with a delicious blueberry sauce. It can be served a number of ways, like as a pie or straight out of the mixing bowl. However individually packaged in a little 4 ounce jar is a super cute and fuss free way to serve them at a party or packed for a picnic! My littlest brother is getting married in June. We love his fiance and can't wait to make it official that she's stuck with our crazy crew. It's so much fun to watch them get excited about planning the big day. To be honest we are all excited, especially Little Dude. He is a big fan of my sister-to-be and he loves a good party, so this is definitely up his alley. He has been practicing some dance moves to get ready. I've seen a preview of some new ones he worked up and I think it's safe to say he'll be a shining star. I was honored to be asked to make desserts for the reception. They are having their wedding and reception at an old barn and orchard property. It is going to be beautiful and a mix of rustic and chic. They want a small wedding cake to cut, but they want a variety of desserts for their guests. He wants some cupcakes, she wants cookies, but they are open to about anything from there. Within a few hours of being asked, I had a list of possibilities formed. Now it's time to create and taste recipes. I figured you wouldn't mind coming along for the recipe testing and tasting ride! 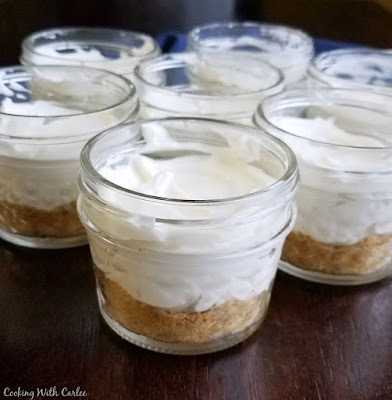 I had done no bake key lime cheesecake jars for a wedding rehearsal last fall and they were a big hit. So I thought it might be fun to do something similar for their wedding. I knew the jars would fit in perfectly with the barn setting and the decor they were looking at. But what flavor should they be? Since their colors are gold and navy and the wedding is in late spring, a fresh combination of lemon and blueberries seemed like the perfect combination. Don't you agree? The test batch went with me to family dinner and luckily they were a hit with everyone, especially the bride-to-be! Whoo! They really are fresh and fluffy and oh so good. I have some fun ideas of how to dress these up a bit for the wedding. Hopefully they are a hit there too! I am going to be giving my mixers a workout getting ready for the wedding. With all the frosting, cookies, cakes and cheesecakes I can't imagine doing it without my kitchenaid mixers. I am lucky enough to have 2, a 4.5 qt classic that I've had for almost 14 years and a 6 qt professional that has only been in the family for a little over a year. Are you as in love with your mixers as I am with mine? 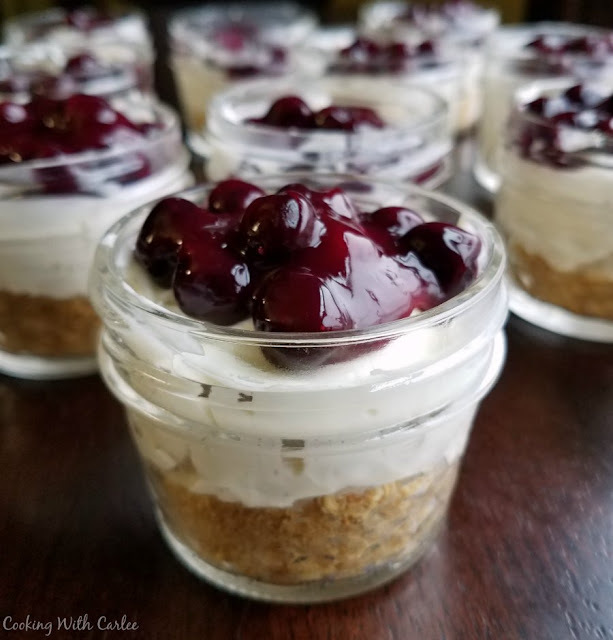 These little no bake cheesecake jars are one of my favorite summer desserts. I also love doing bigger versions rimmed with lady fingers like my orange creamsicle no bake cheesecake! What are your favorite ways to do no bake cheesecake? 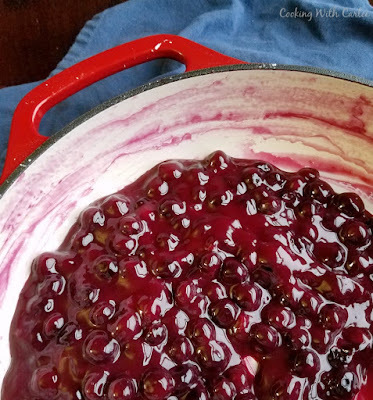 In a heavy bottomed pan, toss the blueberries in the sugar and cornstarch. Add the lemon juice and water and stir to mix. Place over a medium-low burner and cook, stirring frequently until it comes to a boil. Then stir constantly until it thickens. Remove from heat and cool completely before use. 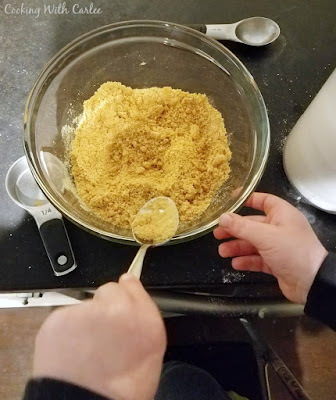 In a medium bowl, mix together the graham crackers, sugar and butter for the crust. Spoon it into the jars and push it down a bit with your fingers to form a crust. Beat together sugar and cream cheese until smooth and fluffy. Add lemon juice and extract and beat until combined. Be sure to scrape down the sides of the mixing bowl. With mixer running on medium speed, slowly drizzle in the cream. Stop half way through to scrape the sides of the bowl and then continue to drizzle in the cream until it is all added. Turn the mixer to high and beat until the mixture is light, fluffy and holds its shape. Spoon about 3 Tablespoons into each jar. I like to use my large cookie scoop to make it easier. Top each jar with about a Tablespoon of blueberry filling and chill until ready to serve. These look so cute and yummy! Would love to serve these outside this summer for an alfresco dessert!! Easy, fun and such delicious flavors!! Great giveaway too! They would be perfect for dinner on the patio or around your new pool! Congratulations to your brother! I'm sure these would be a hit with the wedding guests. I can't wait to see what else you are planning! Thank you! I hope they are! I totally thought of your key lime ones when I saw this this morning. Now that we have a nice big kitchen and are having people over with the "better" weather, I can't wait to make both! What a fun treat. I know the wedding guests will love them. I can't wait to see what else you make! If I won the KitchenAid Artisan Series 5-Qt. Stand Mixer with Pouring Shield I would start off making Glutenfree bread then cake and so many other items for my family! There are so many great things to make!! If I won omg there would be so many things I would make. First I would have to make a double layer chocolate cake for the family! Thanks! There are sooooo many great things to make! These are so cute! I'm totally digging the flavor combination! These are absolutely husband approved! I love that they are not too large or overly sweet. Definitely a dessert that you can count on me eating! Yay! Luckily you are likely to see them again soon enough! Portable desserts are the best! Love blueberry and lemon together! I agree on both accounts! Hi Carlee, if you ever need a food tester just give me a nod! I am so jealous of your family getting to test your creations. Cheesecake is one of my favorites, and these do look super cute. These look so good! I love that they are no-bake! Thank you! They are so simple and soooo good! These really are perfect for a lovely spring wedding! p.s. great giveaway! Tough to say. What wouldn't I make? Actually, I would probably start with meringues. I know, it's too hard to choose! Meringues would be a great place to start! I would make some pizza dough if my name was drawn as the winner! It's hard to go wrong with homemade pizza! I absolutly love this recipe and so does my husband. We tried this last night and guess what it turned out so good we had some for breakfast as well. Thank you so much for this recipe. YAYAYAY!! I am so glad you enjoyed them! Haha! That would be perfect! Love your cheesecake idea! I think that’s a perfect dessert for the wedding. If I won I’d keep on with my current fave - all things bread! Love using a mixer to knead dough, and I’m in need of an upgrade! Homemade bread is the best! Good luck! Oh my do these cheesecake jars look good!!! Congratulations on your brother's upcoming wedding. I love family gatherings like weddings and it sounds like you are going to be super involved. They are lucky to have you. Oooooooh, yum! Now that sounds amazing! If I won this contest, I'll make a surprise lemon chiffon cake with swiss meringue for my mum because I'm winning the mixer for her and lemon chiffon is her favorite. 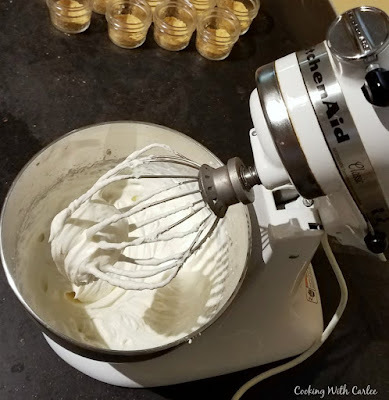 I adore this recipe and idea- love that it is real cream and not cool-whip- not that there's anything wrong with that, but this is fab! I am featuring it for next week's Friday Frenzy! Mercy! No bake cheesecakes are my weakness! Your Cheesecake jars look delicious! Thanks so much for sharing your awesome post with us at Full Plate Thursday and hope to see you again real soon! Now I want cinnamon buns! What would I make? More of your frosting recipes! I would make cheesecake and cinnamon rolls. It is tempting, that is for sure! But the lemon cheesecakes are pretty out of this world too! Blueberry cheesecake is my favorite! I love the idea of making them individual portion sizes and putting them in mason jars. It makes them so fun to serve and even more fun to eat! Thank you! Way to be featured Carlee on Sugar and Spice!!! This little cheesecakes are CLEARLY calling my name! :-o Cheesecake is def one of my big weaknesses. These look amazing! Mine too! I hope you love these!